WCSH 6 meteorologist Todd Gutner (second from right) was one of the speakers for a session concerning changes to the oceans during the 41st annual Maine Fishermen's Forum on Thursday in Rockport. ROCKPORT, Maine — The oceans, particularly the Gulf of Maine region, are heating up to the point that marine species are at risk. 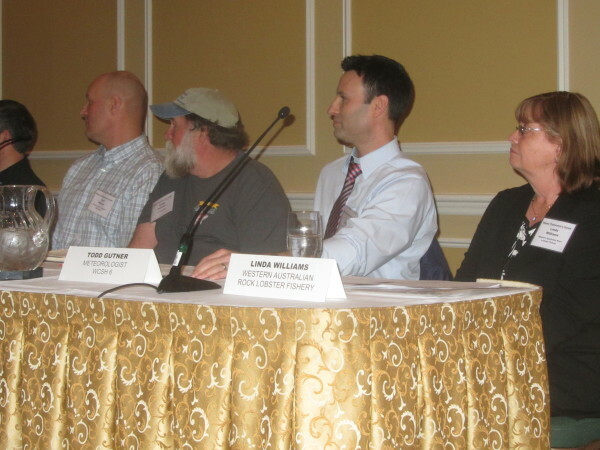 That was the consensus of scientists and fishermen who spoke Thursday during an opening-day discussion on the changing oceans, a session that attracted about 200 people at the 41st annual Maine Fishermen’s Forum at the Samoset Resort. Port Clyde fisherman Gerry Cushman pointed out that while lobster landings are reaching ever-increasing record levels — 123 million pounds in 2015 —- other species that were once plentiful have declined dramatically. Twenty years ago, 36 million pounds of sea urchins were landed in Maine, while the most recent year saw a catch of 1.9 million pounds, he said. The annual scallop catch has dropped from 1.6 million pounds 20 years ago to less than 500,000 pounds. And in 1995, 17 million pounds of shrimp were caught. Cushman pointed out that the current year was the third straight one in which there was no shrimp season here. “A bunch of us think the ocean is changing,” Cushman said in explanation. Andy Pershing from the Gulf of Maine Research Institute said the temperatures in the Gulf of Maine have reached record levels, increasing at about seven-hundredths of a degree annually. He said while that sounds like a small increase each year, it is four times the increase of the global average. John Hare, an oceanographer with the National Oceanic and Atmospheric Administration, said the productivity of the oceans in terms of marine life is decreasing because of those rising temperatures. He said Maine will face significant changes from climate change. WCSH 6 meteorologist Todd Gutner said the 2015-16 El Nino will likely go down as a record strong one, causing higher ocean and air temperatures, surpassing the previous record set in 1997-98. He said studies off the East Coast show that when the water temperature exceeds 68 degrees for more than 15 percent of the days, the death of species increase four- to fivefold. The forum arranged for fishermen from around the world to speak about the effect of changing oceans. One of those was John Mellor, who harvests crabs off California. Mellor said that two weeks before the crab season was set to begin this past year, regulators closed the fishery indefinitely. The closure was the result of a high level of domoic acid being found in the water, believed to come from an outbreak of red tide. “It’s completely devastated our industry,” Mellor said. He said that he has managed to make a living because he has a license to harvest sable fish but that other fishermen who rely on crab fishing have lost their boats and their homes. About three dozen sessions are scheduled during the three-day forum, most of them seminars on fisheries management, science and economics. There also will be health screenings, safety training, sessions on seafood preparation and, as usual, a trade show for vendors. Forum organizers expect 2,500 to 4,000 people to attend each day.